A holiday that explores the exciting diversity of Vietnam on foot. Enjoy walking tours around the must-see city sights in Hanoi, Hue and Ho Chi Minh City, and rural rambles between tribal villages and to ancient jungle temples. Extend your trip to visit the laid-back Cambodian capital of Phnom Penh and incredible temple complex at Angkor. This afternoon we are introduced to life in Vietnam on a walking tour through the bustling streets and markets of Hanoi's Old Quarter. The maze of fascinating alleys is known for its interesting 'tube' houses, whose narrow frontages give way to long rooms that stretch back from the road. Street vendors tempt you with noodles, snacks and stir-fried delights from shoulder panniers, all adding to the charm of Hanoi's historic heart. We can expect today's four kilometre walking tour to take around one-and-a-half to two hours. Leaving Hanoi behind this morning, we drive west to the Pu Luong Nature Reserve, a beautiful region of limestone cliffs, forests and terraced fields that is richly biodiverse. This area is a home to the Thai ethnic minority tribe who live in villages of stilt houses. We will be staying in the heart of the Reserve at the Pu Luong Retreat, an eco-friendly lodge built from traditional materials in a 'boutique' style, with breathtaking views all around. There is even an infinity pool in the former fish pond! At the Retreat we will be staying in its unique stilt house, a beautifully appointed and traditional structure where we sleep on comfortable mattresses in one very large room that can be divided into sections by curtains. The shared bathrooms are connected to the stilt house and open to the elements. See http://puluongretreat.com/house-on-stilt/. On arriving at the Nature Reserve, we hike across the paddy fields to our accommodation while the bus continues there with our luggage. We can expect today's eight kilometre walk to take around two-and-a-half hours across gently undulating terrain. We spend today hiking among the beautiful landscapes of the Reserve and will enjoy plenty of stops along the way, planning to spend time in some of the villages of the Thai minority tribe and have a traditional lunch at a local house en route. Today's leisurely paced hike of approximately 10 kilometres will take around five hours across gently undulating terrain. In the morning we enjoy another walk, rambling alongside the bubbling river with its vast wooden waterwheels which transport its waters to irrigate the terraced paddy fields. Ending at spot where we take to the river on simple bamboo rafts, we float along in this tranquil place and will no doubt feel rejuvenated and ready for our adventure ahead! We return to the hustle and bustle of Hanoi later today with time in the evening to enjoy a performance of traditional water puppets (optional). These puppet shows date back to the 11th century, and performances took place in the flooded rice fields of the villages in the Red River Delta. This morning's walk covers approximately five-and-a-half kilometres and is expected to take around two-and-a-half hours. This morning we will discover more of Hanoi outside of the Old Quarter on a walking tour. Architecturally styled like a French provincial town with tree-lined boulevards and substantial low-built houses, the city is wonderfully nostalgic. Among the interesting sights that we will visit are the charming One-Pillar Pagoda, Confucius Temple and the Presidential Palace. Ho Chi Minh himself, a spartan-living and scholarly man, chose not to live in the Presidential Palace; he preferred instead a simple teak stilt-house specially built for him and which we will see in the Palace grounds. In the afternoon we drive to our hotel at Halong Bay in the Gulf of Tonkin. We can expect today's seven kilometre walking tour to take around four hours including sightseeing. This morning we enjoy the romantic scenery of Halong Bay on a junk cruise amongst the thousands of jagged limestone islands that rise out of the jade green waters like the hairy scales of a submerged dragon! In fact Halong means: 'Where the dragon descends to the sea'. As legend has it the rugged seascape was created by the pounding tail of a dragon as he ran from the mountains into the sea, carving the islands in his wake. During our cruise we'll have the chance to stop at a grotto beneath towering cliffs and perhaps visit a beach and enjoy a delicious freshly caught seafood lunch on board the boat. After disembarking, we return to our hotel in Hanoi to freshen up before boarding the 'Reunification Express' to Hue. We travel 'soft sleeper' class on the train, with four people to a compartment with all bedding provided. Awaking aboard the train, we pass through a rural landscape of seemingly endless rice paddies before arriving in the city of Hue mid morning. This afternoon we will discover Hue's fascinating history on a walking tour around the Imperial Citadel. Located on the left bank of the river, the palace was built by the Nguyen dynasty, Vietnam's ruling emperors from the early 1800s to 1945. The Citadel has formal moats and impressive ramparts that were constructed by 20,000 men and was a copy of the Forbidden City in Beijing. Although most of the inner part of the city was totally destroyed during the month-long Tet Offensive in 1968, the vast outer walls and the west wing remain an eloquent reminder of the palace's former glory. We can expect today's seven kilometre walking tour to take around three-and-a-half hours including sightseeing. This morning we drive out of the city to enjoy a hike through some of the villages that lie along the banks of the Perfume River. Exploring on foot enables us to observe rural life up close and our leader is always on hand to explain what we see. The river supposedly got its name from the aromas carried by the river downstream from the forests and mountains of its source. After our walk, we will catch a boat for a short cruise along the river back to our bus. Today's leisurely-paced hike of approximately seven kilometres will take around three hours. We will walk along village footpaths and the terrain is flat. Today we enjoy a scenic drive south to Hoi An, crossing the spectacular Hai Van Pass en route and passing through rural scenes of thatched, wooden houses and lime-green rice paddies as well as panoramic sea views. The UNESCO World Heritage town of Hoi An was one of the busiest international trading ports of Southeast Asia in the 17th and 18th centuries. First colonised by the Portuguese in the 16th century, it still retains its medieval charm today, with many of its old buildings superbly preserved. The afternoon has been left free to explore Hoi An at your own pace. You may choose to visit the Japanese Bridge or some of the Chinese temples and meeting halls in the Old Town. There are also many shops, bars and restaurants and it is a great place to buy souvenirs, have clothing tailored or simply watch the world go by in a riverside cafe. Today we drive for around an hour from Hoi An and enjoy a hike through a hilly landscape of pine forest and grasslands to the ancient Cham site of My Son. The Chams were dynastic lords who rejected the authority of China in the second century and established their own kingdom in what is now Vietnam. Although they benefited from strong sea links with the rest of South East Asia, the kingdom's interior could not supply sufficient food for a strong military force. For 1000 years they managed to stave off attacks by the Vietnamese and Chinese, before being overcome by the Vietnamese in the 15th century. The site is impressive, despite the fact that much of it was bombed in the 1960s and there are several groupings of Cham temples which we can visit. We can expect today's eight kilometre hike to take around four-and-a-half hours across undulating terrain with a high point of 168m. We can expect today's four kilometre hike to take around one-and-a-half hours. This morning we plan a walk on the island, stopping off along the way to observe some of the traditional cottage industries of the Delta such as the production of rice paper and coconut sweets. Other glimpses of everyday life may include seeing people catching fish from the river, or mending baskets and repairing tools by the river bank. Departing by boat once more we meet our bus in Vinh Long and drive to our final destination of the trip, Ho Chi Minh City. Still unofficially referred to as 'Saigon', the city is the largest in Vietnam with a population of around eight million. You will find an eclectic mix of the traditional and the new, where pagodas and markets compete alongside the trappings of Vietnam's newly discovered entrepreneurial spirit. We can expect today's eight-and-a-half kilometre hike to take around three hours across at a leisurely pace. The terrain of the Delta is flat. This morning we walk around the central sights of Old Saigon, now known as District 1 of Ho Chi Minh City. We see the Notre Dame Cathedral and the GPO building as well as some of the old French Colonial hotels such as The Rex. We then continue to the Independence Palace (renamed the Reunification Hall) and the War Remnants Museum. The afternoon is free for you to explore the city further, perhaps with a visit to the huge Ben Thanh market for some shopping. We can expect today's five kilometre walking tour to take around four hours including sightseeing. This morning we take a short drive out of the city to the infamous Cu Chi Tunnels, which formed an incredible underground command base for 10,000 Viet Cong troops and were a major part of the 1968 Tet Offensive. 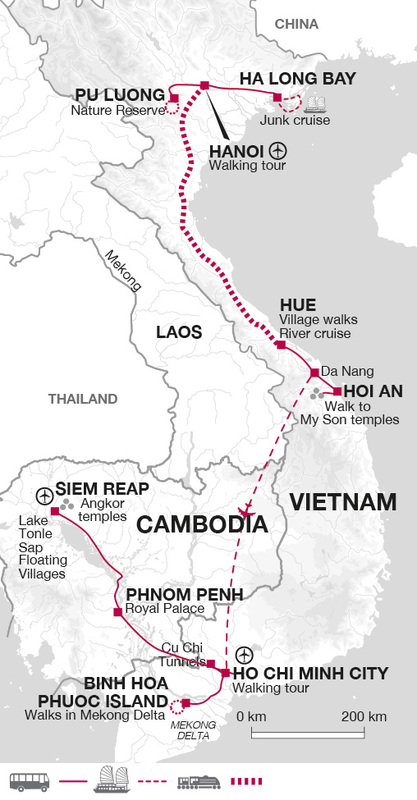 The site is a fascinating insight into the resourcefulness of the Vietnamese. There is the opportunity to crawl through a small specially adapted section of the tunnels should you wish to sample the claustrophobic conditions in which the Viet Cong lived. Afterwards we bid farewell to our tour leader who continues back to Ho Chi Minh City while you join with customers who have been enjoying other Explore trips in Vietnam to continue by road into Cambodia. Border formalities take place at Moc Bai (Vietnam) and Bavet (Cambodia) crossing point. Our final destination is Phnom Penh, Cambodia's capital. Phnom Penh took over from Angkor as Cambodia's capital city in the 1440s. It is now a lively city with many French colonial buildings and plenty to see. Accompanied by a local guide we visit the National Museum, a treasure trove of beautifully preserved carvings and lintels rescued from Angkor; the emotive Tuol Sleng Genocide Museum, formerly a high school that became the Khmer Rouge's main torture and interrogation centre; and the Killing Fields of Choeung Ek - the memorial stupa is a glass tower filled with human skulls - a gruesome reminder of the scale of Pol Pot's atrocities. This afternoon we visit the Royal Palace and Silver Pagoda as well as the temple of Wat Phnom before having some free time in the city. Today is free allowing you the opportunity to explore the city or its surrounds further. Optional excursions close to the city include a trip to Silk Island, Chiso Mountain or the abandoned Royal City of Oudong. Each of these excursions are half a day in duration and may be combined, your tour leader will discuss in more detail. Silk Island or Koh Dach is reached by a short boat journey along the Mekong where the majority of villagers on the island earn a living through producing handicrafts. It is a great opportunity to learn more about traditional ways of life and interact with locals as you learn about silk weaving, woodcarving, pottery, painting, and jewellery making. Chiso Mountain (380m), located in Sia village about 62 km south of Phnom Penh, is topped by the ruins of an 11th century Khmer Brahmanic Temple with fine views of the surrounding paddy fields. Oudong is about an hour north of the capital and offers the opportunity to explore attractive historic temples and stupas. The trip ends in Siem Reap after breakfast. If you have time, you may choose to browse the old market for some last minute bargains, or enjoy afternoon tea at The Foreign Correspondent's Club. Hoi An - Learn about the complex flavours that makes Vietnamese food so delicious. USD $ 39 to USD $45 per person. warmer clothing is needed for the North. Lightweight rainwear is essential year round. You will need a sunhat and may like to bring a swimming costume as some of the hotels have pools. We recommend you take a pair of lightweight walking boots or trail shoes. For the city walking tours and some of the walks, sports sandals will also be fine. One main lockable bag/case, an overnight bag for your trip to Halong Bay (when your main luggage is left behind in Hanoi) and a daypack. Bring a high factor sun cream, sunglasses, water bottle and a torch for use in power cuts and in dimly lit streets at night. Even though bed linen is provided on the train journey, you may want to bring your own sleeping sheet, (it can be purchased in Hanoi), and don't forget mosquito repellent. There is no need for a mosquito net as when necessary, it is provided. Explore Leader: At your discretion you might also consider tipping your Explore Leader in appreciation of the efficiency and service you receive. Although entirely voluntary, tipping is a recognized part of life in this region of the world. Some local staff will look to members of the group for personal recognition of particular services provided. In order to make things easier for you, the Leader may organise a group's tips kitty and if this is the case, they will account for it throughout the tour. For this trip, you should allow US$ 30. Day one and four you stay near the old quarter in Hanoi. The hotel is very basic but clean and comfortable accommodation. Days two and three you stay in an eco-retreat in a traditional and large house on stilts divided into two wings, each contains four bedding areas, set up as twins or doubles. The house has four open-air bathrooms and four open-air rest rooms. The retreat has an infinity pool, wellness centre and open air restaurant. Day six - the train has four berth cabins (two bunks), all the bedding is provided. There are western style toilets and wash basins at the end of the carriage. We advise you to take your won drinks and snacks for the journey. On Day 11 you will stay in a local house with typical Mekong architecture located directly on a river bank, surrounded by gardens, bonsai trees and a variety of tropical fruit orchards. Excellent home cooking is served in the dining room or outside in the garden. This is a great opportunity to spend time with a local family and get to know more about their culture. The homestay conditions are basic; however they have western toilets and showers and are clean. For your last night you stay in a simple centrally located hotel with en-suite facilities. Cambodia: A single visa is required by UK, New Zealand, Australian, US & Canadian citizens and can be obtained on arrival. The current cost is 30USD, a passport sized photograph for immigration will also be required. Alternatively, you can arrange your visa in advance in the form of an e-Visa. To make your application, and for more information contact the Cambodian Ministry of Foreign Affair's direct at www.mfaic.gov.kh. 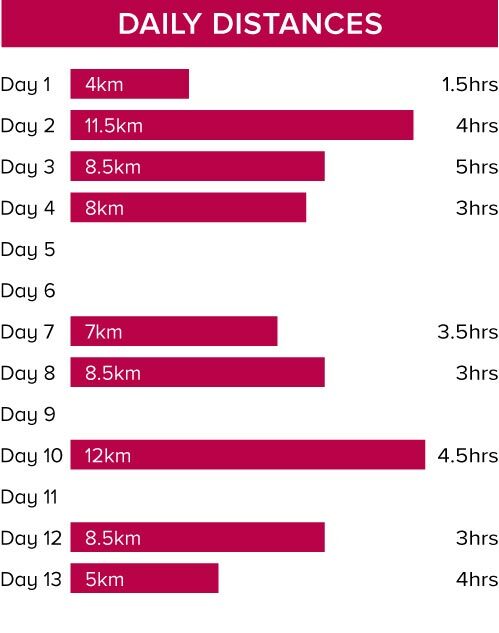 Walks on 11 days for between 1.5 to 5 hours each day. City walks include sightseeing within these timings. Rural walks are on village footpaths and trails. There are no significant ascents and descents but you should be prepared for heat and humidity. We have graded the walking as Easy to Moderate.